HEIGHT: The preferred height range is: Stallions & Geldings 11.3 hh (119.4 cm) to 12.3 hh (129.5cm) at maturity. Mares 11.2 hh (116.8 cm) to 12.2 hh (127 cm) at maturity. GENERAL APPEARANCE OR TYPE: Definite pony character; hard and strong; vigorous and alert and symmetrical in appearance; mealy muzzle; Toad eyes. HEAD AND NECK: Ears short, thick and pointed; clean cut face; wide forehead; eyes large, wide apart and prominent (Toad eyes); wide nostrils; mealy muzzle; clean throat; good length of rein. SHOULDERS: Clean, fine at top, well laid back. CHEST: Deep & wide between and behind forelegs; ribs long, deep, well sprung and wide apart. BACK: Level; broad and level across loins; tail neatly set in. LEGS: Clean and short, with neat hard feet; forelegs straight, well apart and squarely set; hind legs well apart, nearly perpendicular from hock to fetlock with point of hock in line with pelvis bone; wide curve from flank to hock joint; legs free in motion with no tendency to sweep or turn. ACTION: Straight and smooth, without exaggerated action. COAT: Summer – close, hard and bright. Winter – a double-layered dense coat with an under insulating layer of fine, springy hair and an outer water-proofing layer of hard, greasy hair. COLOUR: Bay, brown or dun, with black points; mealy colour on muzzle, round eyes and inside flanks; no white markings anywhere. QUALITY: Alert expression and general poise indicating balance and symmetry of movement; fine clean bone. All Exmoor ponies exhibited in In-Hand Classes shall be shown in natural condition. Trimming of any area of coat, mane, forelock, ears, whiskers and jaw line, under-belly, tail or feathers. 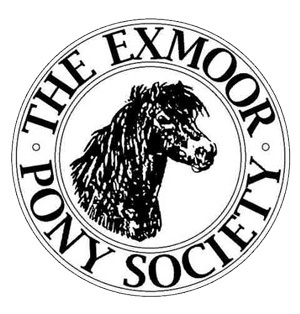 Exmoor ponies exhibited in ridden and/or driving classes shall be shown as in (a) above except that, apart from the legs, they may have been clipped. Any pony that has been clipped cannot be entered in In-Hand Classes until the clipped areas have fully re-grown. 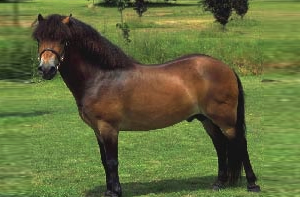 Exmoor ponies exhibited in driving classes shall be shown according to œa and œb above, except that trimming of tails is permitted. Any pony that has had its tail trimmed cannot be entered in In-Hand or Ridden Classes until the tail is fully re-grown. All ponies exhibited in riding and performance classes shall be four years old or over. Colts and Stallions, 2 years old and over, must be shown in a suitable bit. A Member shall not knowingly exhibit a pony bred, previously or currently, leased or produced by the Judge, his/her immediate family or his/her employer.